Weeks of preparation on the ball, receiving, trapping, killing, all pay off. Close control, or lack of it, is one of the two things easiest to observe in a tryout. (The other is pace). Don’t waste time on much psychological preparation except that the player should be bright, friendly, and communicative at the tryout. When bored with skill work, play 3v3 and 4v4 to cone goals. Most players first 100 touches are not their best, yet many players come to tryouts and games and don’t get 100 touches on the ball before the match or tryout ends. From a practical point of view, come early with a partner and get at least 30 minutes of ball work (see point 1 above), preferably more, before the tryout begins. 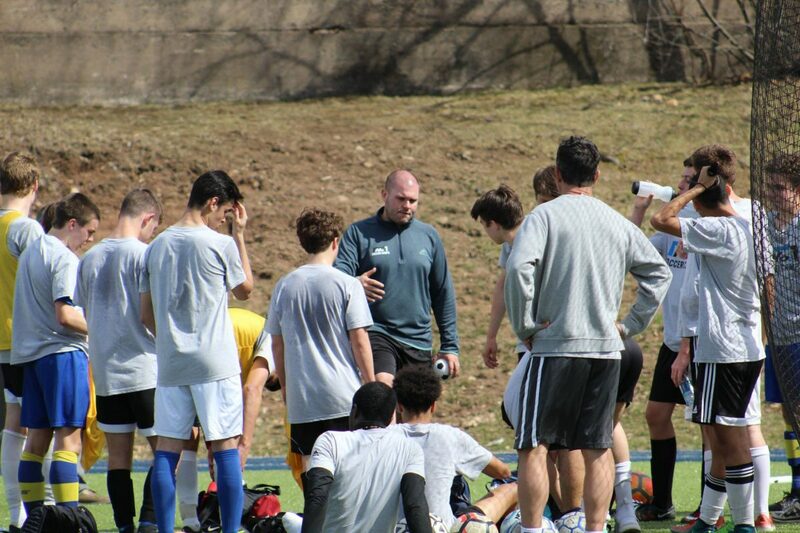 At some ODP tryouts, white tee shirts are mandated, club uniforms are prohibited at most, for a lot of good reasons. But if you don’t have to wear white, why not wear something distinctive but not silly, like an Ajax top with a bold red panel down the front, or a Sheffield type top. I did a U19 ODP tryout once, and everyone had the same stuff on. We had to sprint across the field to pick up numbers that got more crumpled as the time went on. It was a lot easier when one of the other coaches would point to someone with yellow shorts or striped socks and ask an opinion than when pointing to the girl with the same white tee shirt and blue shorts everyone else wore. However, don’t show up in bright green fluorescent clothing, no one will take you seriously. Most tryouts start with small-sided games, like 4v4 or 5v5 to cone goals, and work up to 11 v 11 to goals with goalies. Most decisions are made in the small-sided phase. Often, players are rated 1, 2, 3. Definitely, maybe, and certainly not. In the 11v11 stage, the 2’s get the most playing time because a decision must be reached. Don’t try to guess whether you made it or not by which team you are on. Play vigorously, don’t hold back, and try to win and use as many balls as possible to have as great an impact on the game as possible. For defenders, this means winning balls and then attacking out of the back by overlapping forward of their pass or running with the ball. Midfielders and strikers too should win and use as many balls as possible. The secret of staying involved in the attack is not to hog the ball and dribble the opponents, but to provide instant and continuing support for the passes. Players who give instructions and help other players with verbal and visual cues stand out as leaders. It does not have to be long winded or a continuous narrative, but good communication makes players stand out in a positive way to the observers. Silent players appear to be out of the game mentally. Whenever there is a moment, the player should greet each of the coaches. It is sad to hear kids say that they went to the tryout but did not know who had evaluated them. Players should ask questions to ensure that they understand what’s going to happen at both the tryout and during any follow-on tryouts or administrative mumbo jumbo. Good heavens, please tell the coaches you had a good time and want to play for the team. As a coach, I really have a much harder time cutting kids who show up, work hard, introduce themselves and who ask for the job than I do cutting kids who show up, play, and leave without indicating any interest. Understand that your child may not be the big fish anymore. Have an open mind. Accept that the coaches may see your daughter in a different role than what you have been used to. Don’t be afraid to ask questions of the club beforehand. During tryouts, don’t stand on the sideline and coach them; don’t stand on the sideline lurking or with negative body language. After tryouts, refrain from post-game analysis. Tell them you love them, ask them if they had fun and where they want to eat. Sit back and enjoy. The angst that the players feel might go away if you’re relaxed. Dealing with disappointment is an important lesson that young people need to learn. With acceptance or rejection comes a teachable moment and a life lesson. Take a neutral stance on the outcome of the evaluation process. Support them no matter what the outcome is and that you are proud of them no matter what. Ranting, raving and otherwise placing blame will harm your children’s development.